We developed the Island Friends stories as a way of supporting teachers and families to teach little ones about behaviours and attitudes that will help them in life. Each story links to the eggs framework – and demonstrates one or more of the behaviours in action (you’ll see which ones on the back of each book). We’ve been working with a fantastic group of teachers to develop and test a range of teaching and learning resources to support the books and we were absolutely stunned by the positive reaction from the children and teachers who took part in the project, which was supported by Welsh Government - see some of their comments in the Reviews and Recommendations section below. By recognising resilience, creativity, teamwork and positive attitude teachers and children were able to increase motivation and engagement, and this had a knock-on effect on their learning both at home and at school. Our pilot project with schools has been more successful than we could ever have imagined, so we’re now keen to engage with more schools who may want to use the framework and resources. Our friends at the Wildlife Trust of South and West Wales wanted to develop resources that would help family visitors to Skomer Island learn about the wildlife, history and ecology of the island, so we worked with them to create a series of fun trails and quizzes featuring the island friends characters. The trail packs are free for families to borrow during their time on the island, and are returned at the end of the day, making them a sustainable option. The project was funded with money raised by Wildlife Friends founder Lucy Griffiths and her friend Llinos Humphreys for walking the 186 mile Pembrokeshire Coast Path in aid of the Wildlife Trust. "AMAZING, WHAT AN EXTRAORDINARY EXPERIENCE!" To help promote family wildlife activities and adventures in Wales we recently worked with the Wildlife Trust of South and West Wales on a project funded by Welsh Government to create two incredible virtual reality experiences ‘Dolphin Dive’ and ‘Flight of the Kingfisher’ to give people a taste of the wildlife experiences Wales has to offer. 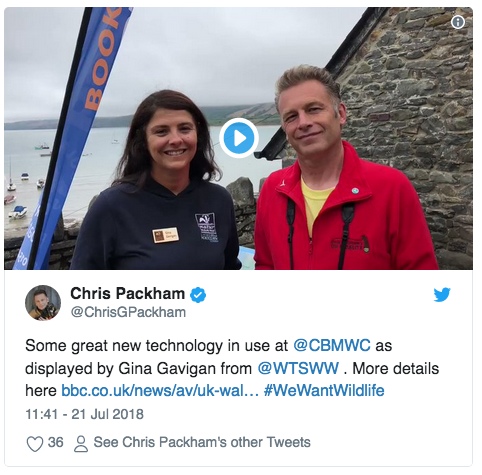 The Wildlife Friends characters featured strongly in the campaign and supporting materials and the response from the public has been incredible - resulting in the project winning a National Tourism Award for innovation.